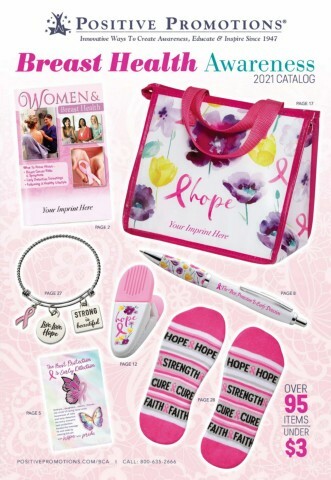 Show your support for breast cancer awareness with promotional products from Positive Promotions. We carry a large supply of pink ribbon wristbands, pins, posters, t-shirts, and more breast health products. Pink ribbon items are a great way to raise awareness to the plight of breast cancer. They make excellent gifts and help support a worthy cause. We offer hundreds of pink cancer awareness products, including hats, bracelets, signs, stickers, and breast cancer apparel. Pink stylus pens make fantastic giveaways at charitable events and fundraisers. Our pink awareness t-shirts come in a variety of designs and styles with sizes ranging from small to 2XL. Use our cancer awareness temporary tattoos to show your pride during charity walks and marathons. All of our pink breast cancer awareness products will help you show support. Over 230,000 women are diagnosed with breast cancer each year. Pink ribbon pins, apparel, and adornments help pay tribute to breast cancer survivors while also raising awareness. Our pink awareness decorations are perfect for charitable events and support meetings. We also offer breast health awareness products for men that will help them show support for the cause and inspire them to be more involved in the fight. At Positive Promotions, we pride ourselves in offering a large selection of pink breast cancer awareness products for our customers to demonstrate their support and celebrate cancer survivors. Whether you are organizing a health fair or raising donations for a marathon, we have what you need to keep the focus on breast health awareness year-round.